A WPtouch Pro theme tailored for WooCommerce. MobileStore is the most advanced mobile theme for WooCommerce, ever. Designed for mobile, with no compromises. Off-canvas menu and cart support, coupled with multi-touch product pages and one-page checkout— easily make MobileStore the best way to sell via mobile online. With a focus on speed and conversion, MobileStore is designed for you to maximize your mobile sales and offer visitors a happy browsing experience. MobileStore was designed for mobile, making no sacrifice in delivering high-quality mobile shopping. Built just for WooCommerce, MobileStore seamlessly integrates with the most popular eCommerce platform for WordPress. 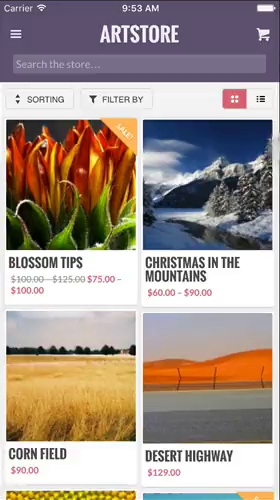 Using isotope, MobileStore neatly fits your products into grid or list views. Customers can easily filter product listings with a few taps, or sort products by preference. MobileStore remembers and intelligently restores where you are in product listings. The left menu is accessible from any page and contains product categories, recently viewed items, and site navigation. The mini-cart is also present everywhere, showing customers what they’ve added and making it easy to proceed to checkout. We’ve specially designed an off-canvas menu system that adds polish and delight for mobile visitors. The menu shows a list of recently viewed items for customers so they can quickly return to an item of interest. MobileStore makes it easy for customers to move through the cart and checkout areas of your store, increasing conversions and satisfaction. Customers can examine and explore product photos easily and intuitively. Thumbnails allow customers to switch gallery images, while high-res images are swapped in automatically. Ratings and reviews for products are supported out-of-the-box, no configuration needed. Product descriptions, variations, and custom attributes are all displayed automatically and organized intelligently according to your setup. If related products/cross-sells are enabled, MobileStore will display them on product pages automatically. Intelligent checkout form elements reveal labels and are typographically clear throughout the flow. Our checkout process uses contextual keyboard switching to help users fill out forms that require numbers vs. letters. MobileStore’s elegant checkout flow moves customers through the purchase process quickly and easily. Inline login and easy coupon application streamline the process of checkout and keep customers going. MobileStore offers your payment methods in an intuitive, clear accordion payment method picker. A customer can change between your desktop and WPtouch theme, without interrupting thier purchase. We support a wide variety of payment gateway providers & plugins out of the box, including Amazon Payments and Stripe. Enhance MobileStore with WPtouch features like our Infinity Cache extension to make your mobile website even faster. MobileStore automatically inherits and respects your WooCommerce settings and configuration. No need to setup twice. Add your logo, brand colors and other preferences to customize MobileStore as you like. Offer an app, without the App Store. MobileStore can be saved to homescreen on iOS devices like an app. MobileStore officially supports WooCommerce version 2.3 or higher, and WordPress 4.0 or higher. MobileStore works on all major platforms and works with older devices like the iPhone 4 and Nexus S, too.